Safe Speed Forums • View topic - Body armour - do you or don't you. Body armour - do you or don't you. Armour is a slightly different subject from the t-shirt/shorts debate, I came back to bikes a couple of years ago after a while away and getting the 90's kit out again I realised that almost none had armour or the provision for it. All I haven't replaced is two pairs of denim jeans with pockets for knee and hip armour, which I've upgraded to new CE spec, and which are great in the current weather. I don't ever go out without at least jacket/jeans and always gloves and boots. It's a topical subject though, there's a lot of exposed flesh about on two wheels at the moment and the potential for hurt of the office-wear-clad scooterists I see in the City makes me cringe. Still, "your choice, your skin". I'll be keeping mine, thanks, you do what you want with yours. Body Armour - Bikera -(those on powered bikes) --you have my total respect and admiration - no way would i get out on the road without some form of metal shell surrounding me - don't look on you as maniacs - just respect you (and try to look out for you) . Now - seeing a rider in jeans + T shirt - i give them room - miles of it - they ain't had the forethought to go out ready for the worst. So carry on with your hobby - can guarantee you've got one fan prepared to let you past. Q. Are you a stupid fascist with limited reading skills or are you just a retard? Last edited by FJSRiDER on Wed Oct 04, 2006 14:39, edited 1 time in total. I can see two sides to this..
On the one hand I wear protective gear (and high vis in the winter/night) all year round although my winter kit which doubles as my hot weather kit (liner removed) is probably significantly less protective than my leathers. I don't wear it 'cos I think it will save my life. I wear it as an insurance policy - a pretty crappy TPO type of cover... It might lesson my injuries and give me some protection from contributory neglegence claims. But thats about it. I'm with Gizmo and the non-nannying brigade on this one. Whilst I usually wore leathers or equivalent in my motorcycling days, I also occasionally used only non-protective clothing when the weather was hot and I was going for a relaxed "jaunt". It's all about individual freedom, responsibility and risk-management. Pedestrians could be spared many injuries in accidents with motor vehicles if they wore protective clothing. The same goes for people who get injured in domestic accidents (of which I believe there are very many, every day), protective attire may have mitigated their injuries. Prevention is only better than cure if the price of prevention is not too high. Otherwise we wouldn't get out of bed in the mornings to face the day-to-day risks we normally manage and face. This is how I like to ride.....when it is 30+ degrees in a helmet free state! 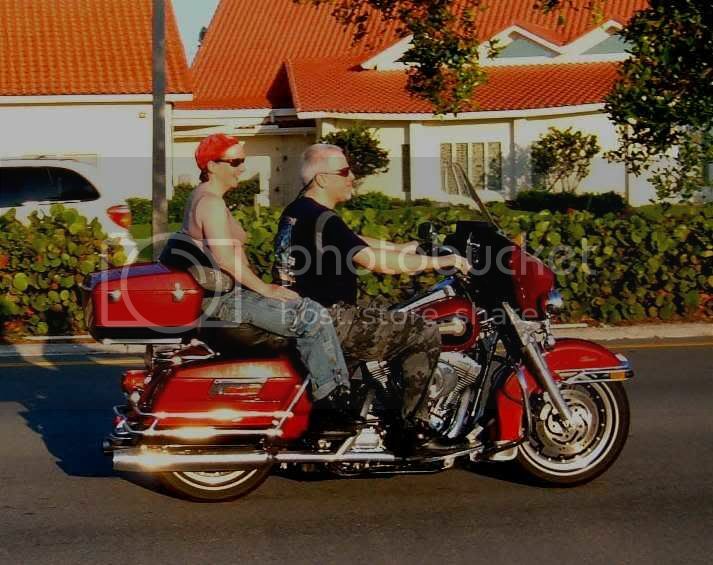 The pic was taken in May this year early morning and just leaving Naples Florida on the way to Miami. Last edited by diy on Tue Aug 01, 2006 19:20, edited 3 times in total. what did you think of the electra glide? Took some getting used to. We rode it from LA to Miami (3500 miles) that was the last leg of the trip. I have rented Road kings before but never so loaded-up. For the first 1000 miles or so it felt very top heavy then I got used to the weight. Also the saddles are much better than the Road King. The great thing is that you could do 400+ miles a day without feeling fatigued. The reason I picked it was because of the carrying capacity. Everything we had to carry for the 10 day trip was in hard/lockable luggage. We had to carry half-shell helmets for some states we crossed. Also biker jackets when we got up to altitude (and a hail storm in Tennessee). The most important bit of gear I had were my trusty Belstaff boots. And certainly 2 out of the 3 could have been avoided by careful observation and defensive riding. Advanced training - another good insurance policy. Although not recognised by my insurer! When I was renewing my policy, I asked about what discount was offered for having Advanced Training, and whilst they thought it was a good idea (!) it wasn't recognised. I tend to find it can still be a good negotiation point..
"XYZ quoted me 20 quid less - guess thats because they offer discount for ABC membership." I've also phones the same companies twice and got different versions of the discount available.